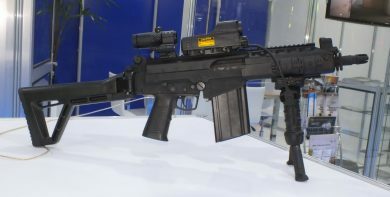 During the recent (April 4-7, 2017) LAAD Defence & Security exhibition in Rio de Janeiro, IMBEL – Indústria de Material Bélico do Brasil showed the latest development examples of its 7.62x51mm IA2 carbine and rifle prototypes which are expected to soon join the similarly-designated 5.56x45mm variants currently in full production at the company’s Fábrica de Itajubá (Itajubá Factory) facilities in Minas Gerais State. 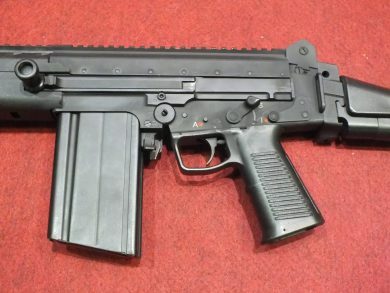 When the IA2 program got a real start around 2009-2010, emphasis was on the development of the 5.56x45mm model, since that’s what the Brazilian Army and police forces were expected to acquire in large numbers, what eventually happened. However, a 7.62x51mm-chambered gun somewhat based on the FAL (for long time, license-produced by IMBEL) was also developed side-by-side, though in a secondary position in the priorities list. Anyway, prototype examples of both types were already being demonstrated at selected Brazilian Army units in December, 2010. Examples of both the 5.56x45mm (foreground) and 7.62x51mm variants of the IA2 rifle were ready for initial demonstrations late in 2010. 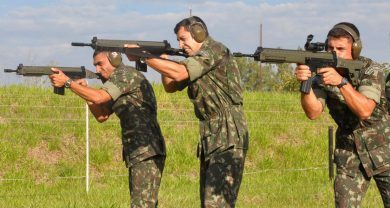 The semi-auto carbine version, primarily aimed at the LE market, is currently undergoing an official certification test program at CAEx – Centro de Avaliações do Exército (Army Evaluation Center) in Rio de Janeiro. 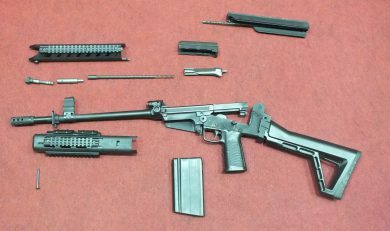 Although it has inherited the FAL tilting-block breech locking bolt, plus the firing mechanism and the very same 20-round steel magazine, everything else is derived from the 5.56x45mm model, but this includes a re-dimensioned piston gas system. Polymers, of course, are found everywhere, such as in the side-folding stock, hand guards, and the pistol grip, which clearly shows less forward inclination than that of the well-known FAL. With the stock extended, the 7.62x51mm IA2 carbine is 800mm long, the cold-forged barrel being 265mm in length. Gun’s empty weight is 4kg. 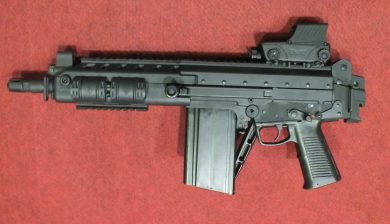 Full-length Picatinny rail on top and shorter ones around the handguard. The IMBEL carbine gets pretty compact (550mm) with the stock folded to the right, while still keeping the firing possibility. Note the MEPRO M5/MEPRO RDS PRO Red-Dot Sight, compatible with GEN II and GEN III NVGs as well as with magnifying scopes. The 7.62x51mm IA2 carbine in an even more businesslike configuration resting on a frontgrip/bipod and fitted with a MEPRO MOR Multi Purpose Reflex Sight with Laser Pointers and, aft, a MEPRO MX3-F X3 Magnifying Scope with Integrated Slide Flip Adaptor. 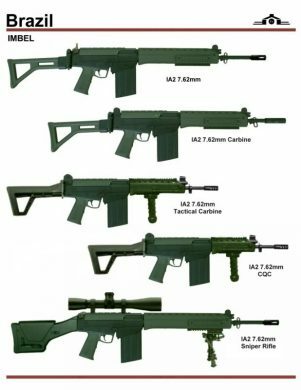 As far as the selective-fire IA2 rifle version is concerned, TFB was told that Brazilian Army official certification tests are scheduled to start sometime in mid-2017. The gun features the same general configuration, but is fitted with a longer (390mm) barrel, which raises overall length to 920mm (or 670mm, stock folded). Empty weight, 20-round steel magazine in place, goes up to 4.3kg. The 7.62x51mm IA2 rifle features a 390mm barrel fitted with FAL’s NATO-standard flash hider, being 920mm in length overall and weighing 4.3kg with an empty magazine in place. The IA2 rifle, polymer stock folded, and (below) a closer view of basic grip/trigger/fire-selector area. Typical FAL cylindrical charging handle and disassembly latch are recognizable. Wait no longer: here’s the first published photo of the 7.62x51mm IMBEL IA2 rifle field-stripped. Steel lower receiver and anodized aluminum upper, all metallic parts being parkerized and covered with epoxy paint.